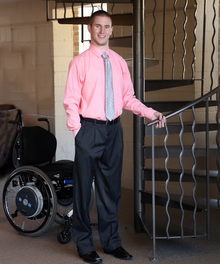 Chris suffered a spinal cord injury while playing football at Luther College (Iowa). The doctors gave Chris a 3% chance of moving anything below his neck again. Four years later, he defied the odds and walked across stage at his college graduation with his fiancé, Emily Summers. The video went viral twice, garnered 300 million+ views, and caught the eye of the country’s top media outlets like Good Morning, America, TodayShow.com, NBC Nightly News, CBS, USA Today, Sports Illustrated, to name a few. Three years later, Chris attempted another incredible feat – this time, perhaps the most important walk of his life – down the aisle with his wife, Emily. As with his Graduation Walk, Chris prepared relentlessly, spending four hours per day in the gym. Chris and Emily joyfully conquered the challenge – and walked seven yards down the aisle after their wedding ceremony. Seven yards symbolized the seven-year anniversary of his injury. Their beautiful story once again captured the heart of the world, with coverage ranging from nearly all of the top-tier U.S. media outlets to media in Germany, Italy and London, to name a few. Chris is a well-respected motivational speaker and speaks at events all across the country. Chris’ message focuses on the fact that we all face challenges, but our circumstances don’t define us – we do. With inspiring anecdotes and positive action steps, Chris connects with his audience in a genuine, entertaining and impactful way. His message resonates with all of us: adversity is universal, but we all have the Power to Stand. Additionally, Chris has written a book; he and Emily are releasing their second book The Seven Longest Yards; and a feature documentary titled 7 Yards. Chris created the Chris Norton Foundation, which is a nonprofit organization dedicated to helping people with spinal cord and neuromuscular disabilities by providing opportunities that would not otherwise exist. This is achieved through supporting the purchase of rehabilitation equipment for organizations/facilities and providing services and started his own wheelchair camp. To date, the Chris Norton Foundation has raised just under $1 million dollars. Chris and Emily have adopted five beautiful girls and have fostered 17 children. They are both deeply committed to providing a safe, loving home for children in need. They are truly a remarkable couple, who positively impact those around them. The Power to Stand (signature keynote): We all deal with change, no matter how big or how small, no matter who you are or where you come from. Life & work can alter quickly but that’s not what’s important… What is important is whether or not we will stand back up. This keynote dives into the essence of what it takes to have The Power To Stand, how to persevere through the most challenging obstacles, and how to navigate change in life or work.